Heiko Heinze – Page 2 – Protecting The Environment is an opportunity! From 25th September to 1st October the 2nd meeting of the Erasmus + project 2015-2017 was held at Pestalozzi Radeberg. 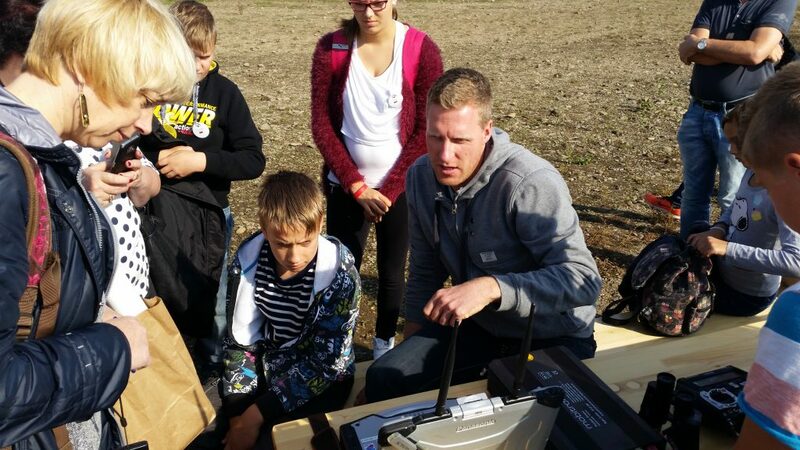 After the successful 1st meeting in April 2016 in Bescanó, Catalonia, Spain, this time we hosted 31 31 students and teachers from Finland, Lithuania, Spain and Turkey. 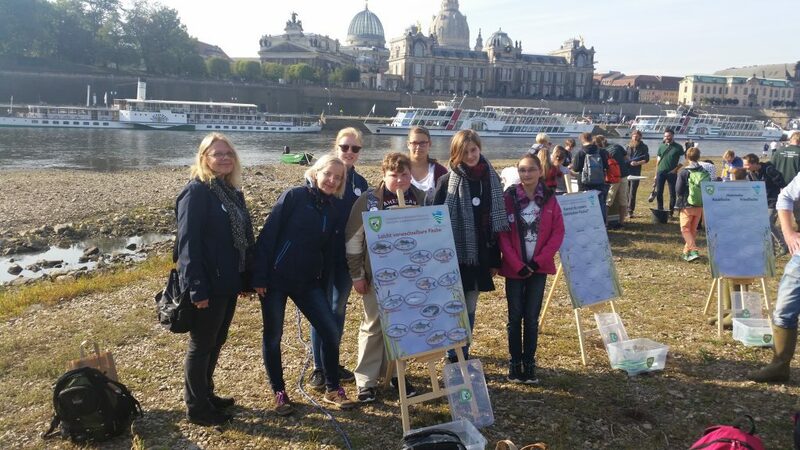 For a week, the foreign students learned together with their German host children according to the project theme “Protecting the environment is an opportunity! Not a burden we must bear! ” („Umweltschutz ist eine Chance und keine Last, die wir tragen müssen“) at the Pestalozzi School and other interesting places. 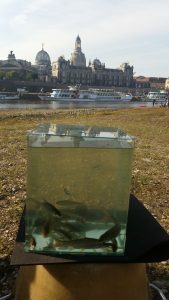 On Monday we participated at the Kings’ Riverbank” in Dresden in the “International Day of the Rivers”, where we learned a lot of interesting things about the River Elbe and life in and around the water. 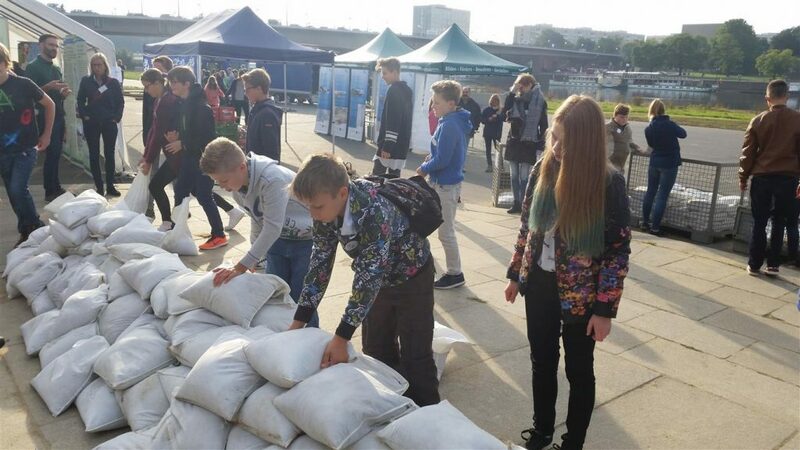 The competition “Building a wall against the flood with sandbags” made us sweat easily. On Monday afternoon the official welcome ceremony took place. Pupils dressed up in costumes as “August the Strong” and “Countess Cosel” led through the programme and were also the most wanted photo models during the school yard festival. “Overcoming differences and finding friends for life through languages” was the motto of this year’s “International Day of Languages”. 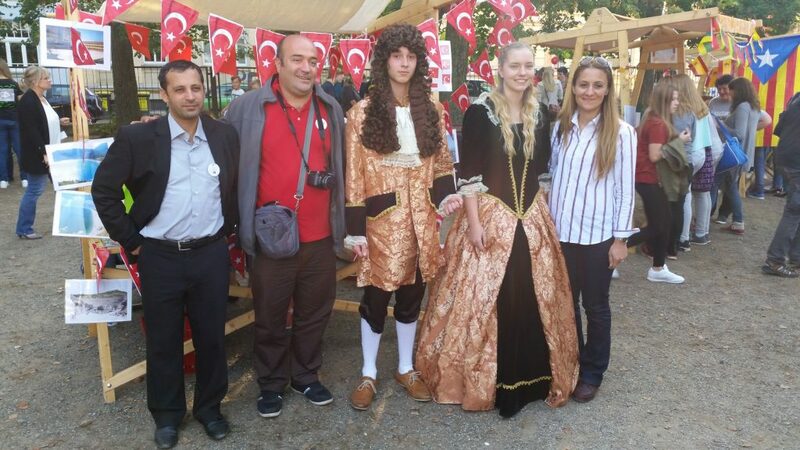 Each guest school had its own stall with products typical for their country. 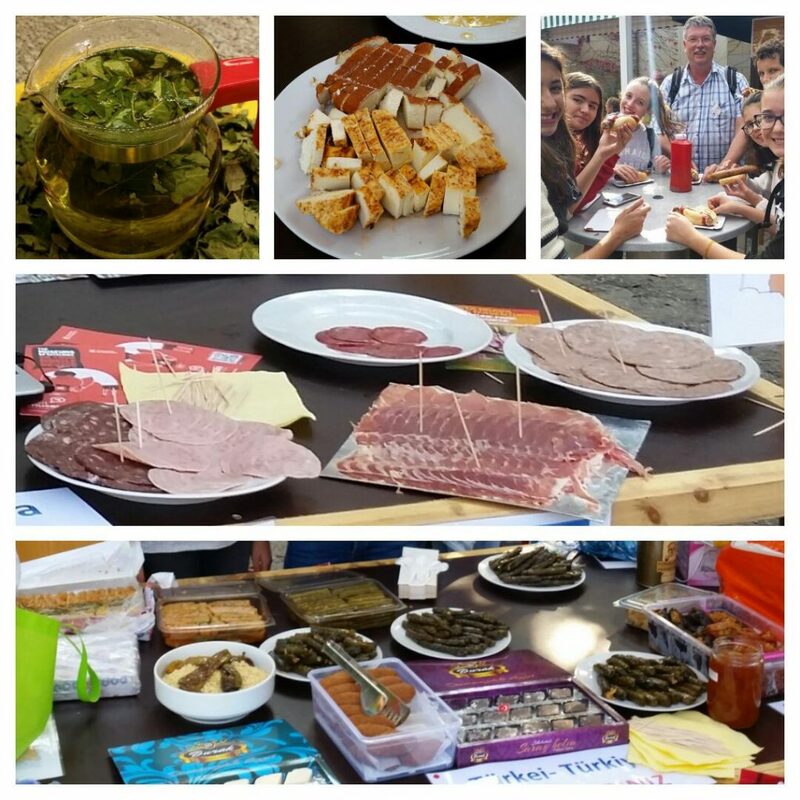 Lithuanian cheese (Lietuviškas varškės sūris) with delicious honey, stuffed vine leaves from Turkey, the Catalan sausage specialty Butifarra and freshly made birch leaf tea from Finland attracted many curious people. Tuesday started with attending school lessons during which the guest children gained insights into German school life. Our teachers had prepared lessons in English especially for our guests! After that we showed the presentations by all participating countries on the subject of “Environmental Problems in the Regions”, in English of course! There was also a logo contest within the framework of the Erasmus + project. A winner logo was determined, which ultimately came from Finland. The last point of the program on this day was – what else could you have been expected? 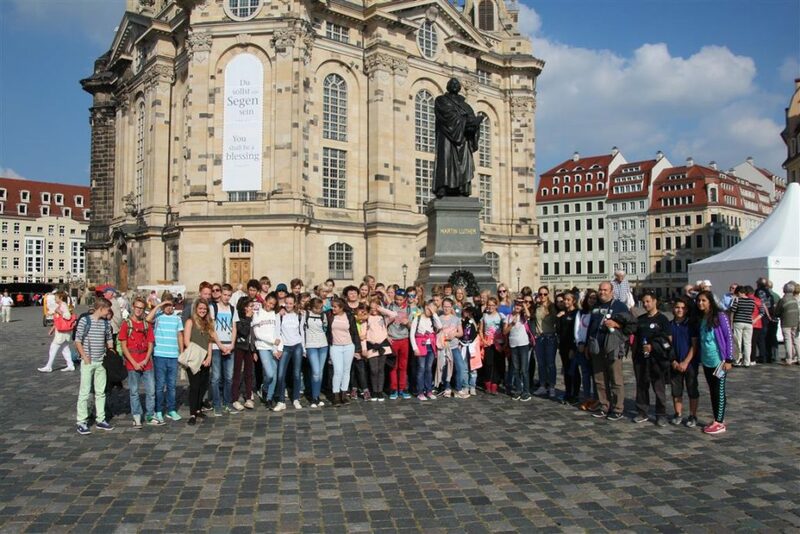 – an English guided city tour in Dresden where we visited among other sights the Frauenkirche. We admired the Fürstenzug and made a stop in the Dresden Zwinger. 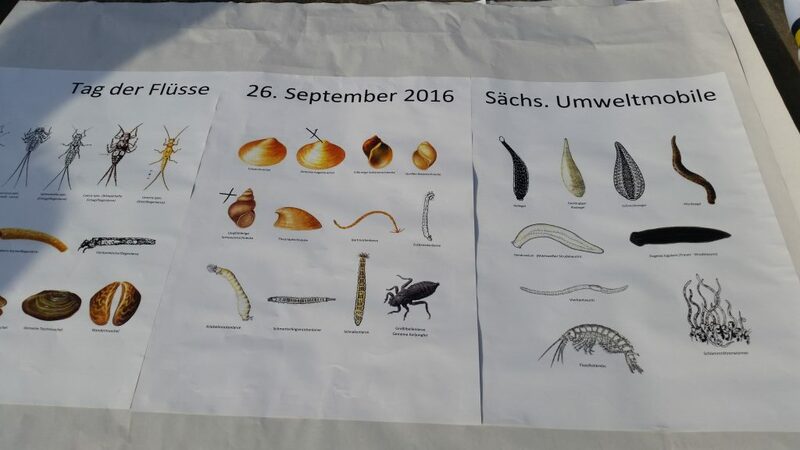 On Wednesday we got to know the sewage treatment plant in Dresden Kaditz, one of the most modern in Europe. 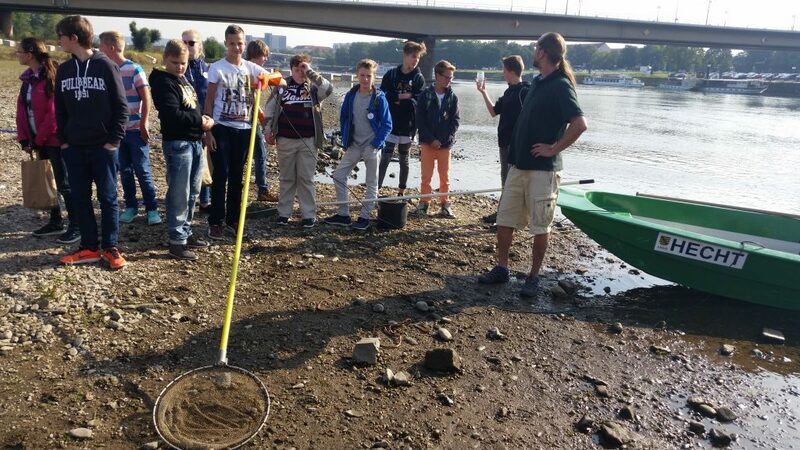 During the tour we learned a lot of interesting facts about the precious resource of water. 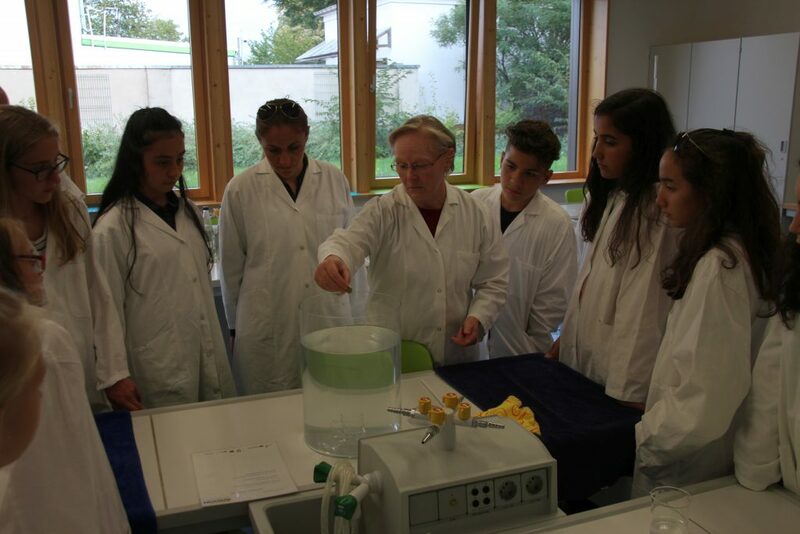 In the student laboratory “Aquamundi” we were able to carry out a variety of experiments. Also on this project day our common language was English. Before we went back to Radeberg in the evening we still had some free time for shopping in the Elbepark Dresden. On Thursday the visited the opencast coal mine Welzow-Süd. 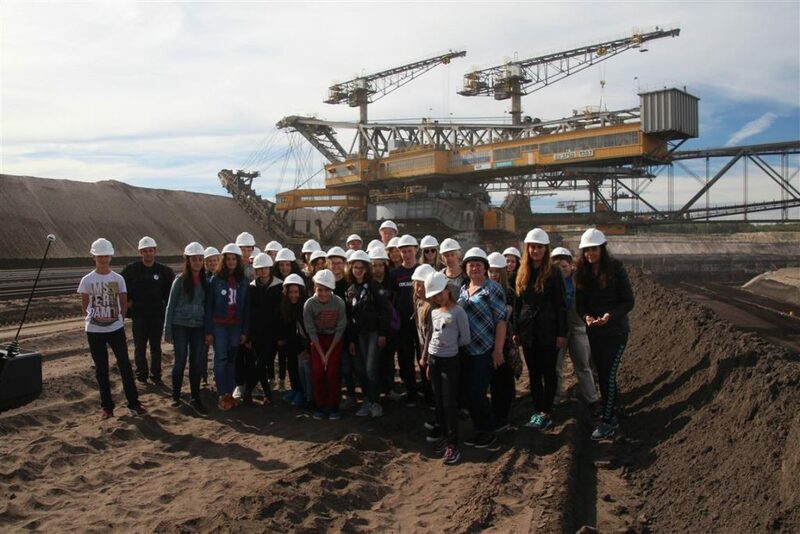 We got an unforgettable insight into the mining of lignite during this very interesting tour into the open pit. On the way back we made a stopover at Lake Senftenberg and saw how to recultivate land after the completion of mining and use it for recreation. 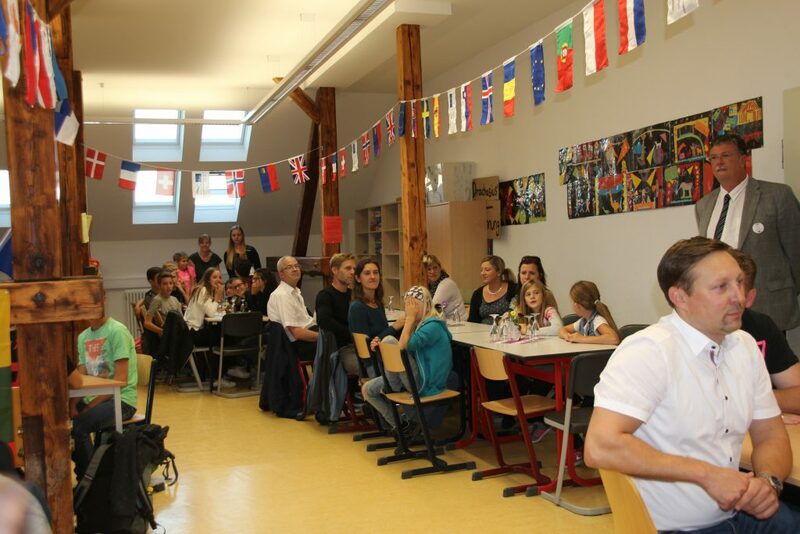 In the evening we celebrated a Farewell Party together with our guests, parents and teachers at school. 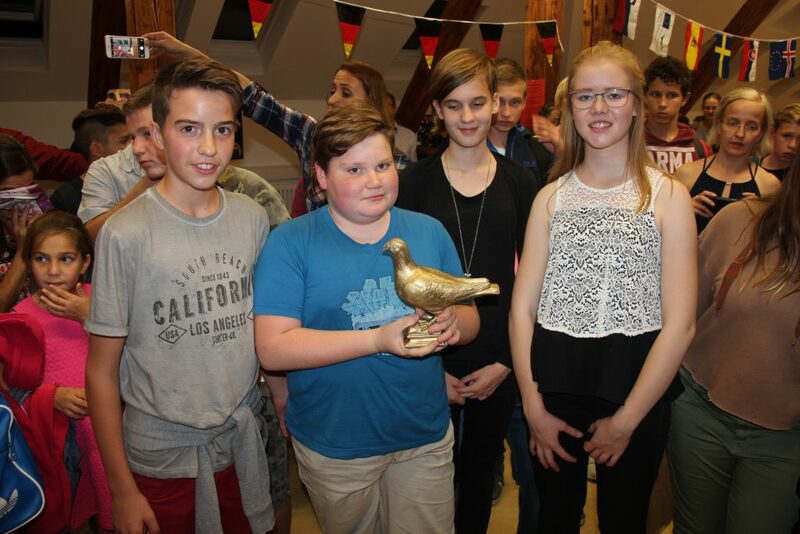 The Golden Pigeon, a symbol of our project was handed over to Finland. In addition our thanks went to all families who lovingly cared for their host children or contributed otherwise to the success of this week. On the last day of this project week we showed our guests the beauty of our homeland on a nature excursion to Saxon Switzerland in fabulous autumn weather. First we went by train along the Elbe River Valley. Then we crossed the stream by ferry and hiked from the village Wehlen to the Bastei and back. On our tour a guide from the National Park Service taught us how this unique landscape was created by water millions of years ago. The last evening and also Saturday until the departure was free for leisure activities with the host families. 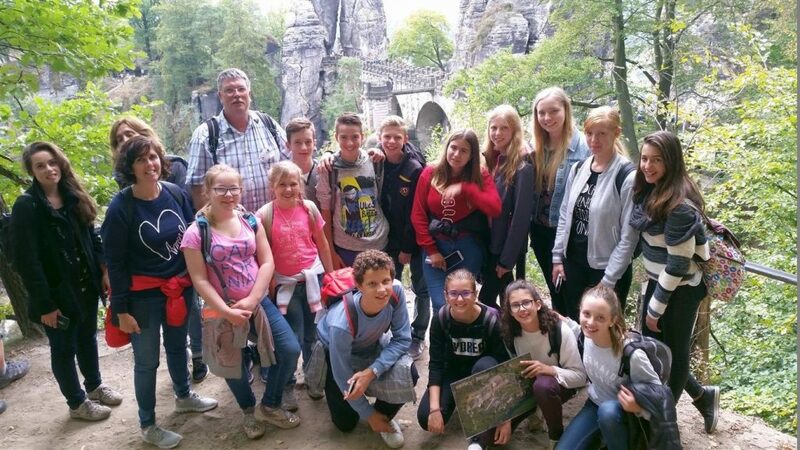 And they came up with some more highlights: bowling with the families, a visit to the famous Semper Opera, a steamboat trip on the River Elbe or a rock climbing tour in Saxon Switzerland. On Saturday there was, as always at our meetings, the tearful farewell to our guest children. This week saw many new friendships making it even harder to say goodbye.